Prudêncio, P. and Guilgur, L. G. (2015). Protein Extraction from Drosophila Embryos and Ovaries. Bio-protocol 5(9): e1459. DOI: 10.21769/BioProtoc.1459. Guilgur, L. G., Prudencio, P., Sobral, D., Liszekova, D., Rosa, A. and Martinho, R. G. (2014). Re-quirement for highly efficient pre-mRNA splicing during Drosophila early embryonic development. Elife 3: e02181. Here we provide the description of protocols to efficiently obtain protein extracts from embryos and ovaries of Drosophila melanogaster. These protocols are routinely applied in our laboratory and are based on two techniques: either embryos or ovaries are homogenized using a pestle and then the soluble proteins separated by centrifugation, or embryos are individually lysed by needle manipulation. The latter technique allows the use of small embryo numbers and the selection of specific developmental stages (Guilgur et al., 2014). Rear female flies alongside a small fraction (1:3) of males in food supplemented with fresh baker yeast paste for one to two days prior to dissection. This will stimulate oogenesis and lead to bigger ovaries (with increased numbers of late developmental stages). Inactivate anaesthetized flies by decapitation. Dissection technique (under stereoscope and using dissection plate and a pair of tweezers): For each fly, place the organism in a drop of 1x PBS and hold it in place by applying gentle pressure at the level of the upper thorax. Using the tweezers in the free hand tug gently at the lower part of the abdomen (ovipositor region) until the cuticle starts to detach from the fly, exposing the internal organs. Isolate ovaries from adjoining tissues and organs and transfer them to ice cold 1x PBS while dissecting the remaining flies (avoid keeping the ovaries in the 1x PBS solution for periods longer than 30 min) (see Video 1 for a visual description). Transfer the isolated ovaries to a 1.5 ml tube containing 200 μl of ice-cold NB lysis buffer. Manually homogenize samples using a pestle. Homogenization should ensure the complete breakdown of the tissue. If pestles are to be reused, wash them thoroughly with distilled water before processing other samples. Centrifuge for 20 sec at ~10,000 rcf (4 °C) to settle down at the bottom of the tube the unprocessed tissue. Repeat manual homogenization of the centrifuged material. Centrifuge for 3 min at ~20,000 rcf (4 °C). Transfer the supernatant to a new 1.5 ml tube, avoiding the upper lipid layer. Repeat this centrifugation process (steps A2 e-f) two more times. Quantify protein concentration and dilute to the final concentration (dependent on the requirements of downstream applications). Dilute final concentration with an equal volume of 2x Laemmli sample buffer. Heat samples for 5 min at 100 °C and immediately freeze them at -20 °C after a quick centrifuge spin-down. Extracts can be stored at -20 °C until necessary. For one to two days prior to embryo collection rear male and female flies on collection cages with standard apple juice agar plates supplemented with fresh baker yeast paste (Figure 1 A). Start the collection by placing a clean apple juice agar plate on the cage. Let flies lay eggs for a given time interval. While egg laying is taking place prepare the 5 individual containers for the subsequent processing of the embryos. Containers with the following solutions are required: 0.1% Tween 20 (in water), 50% commercial bleach (in water) and deionized water (3 containers). Place a collection basket (cell strainer) into the container with the 0.1% Tween 20 solution (starting point) (Figure 1A). Collect embryos from the agar plate using a small paintbrush and place them in the partially immersed basket. Gently stir the collection basket to wash the embryos. Dry the base of the collection basket in a paper tissue before transferring it to the subsequent container. Transfer the embryos in the collection basket to the container with the 50% commercial bleach solution. Incubate for 5 min with gentle, periodic stirring. The purpose of this step (dechorionation) is to remove the chorionic membranes which constitute the eggshell covering the embryos. The dechorionated embryos will become hydrophobic and will float on the surface of the bleach solution (Figure 1B). Transfer the embryos in the collection basket to a new container with deionized water. Wash for 2 min and repeat twice using each time new containers. Before starting the washes and also when transferring between the water containers dry the base of the collection basket in a paper tissue. Note: Embryos can be stored at this step by transferring them to a 1.5 ml tube (remove excess water) that will be flash frozen in liquid nitrogen prior to storage at -80 °C. Figure 1. Set up for embryonic protein extraction. Fly collection cages with standard apple juice agar plates and solution containers set up (A). Dechorionated embryos float on the surface of the bleach solution (B). Manually select embryos collected in a 0.5 ml tube lid (C1). Punctured embryo total extract (C2). Total extract collection by mixing with Laemmli sample buffer (C3). Embryo collection before pestle homogenization (Arrowhead 1, D1). Embryonic soluble protein extract after homogenization and centrifugation (Arrowhead 2, D2). 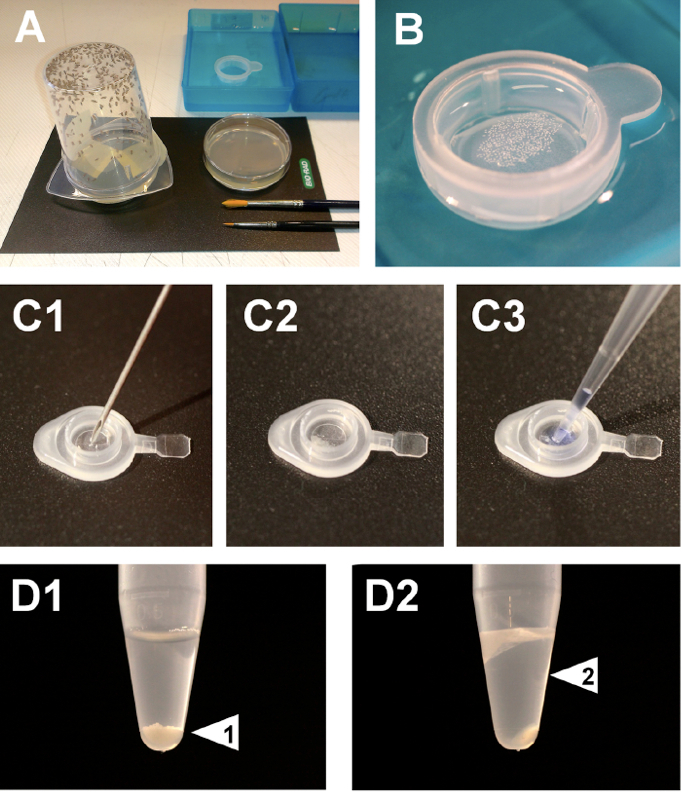 After dechorionation, manually select embryos with sharp tweezers or a fine paintbrush and transfer them to a previously sectioned 0.5 ml tube lid (for a minimum of 10 embryos per lid) (Figure 1C1). Dry as much as possible the embryos by absorbing the excess water with a dry paintbrush. Individually puncture each embryo using a needle (Figure 1C2). Gently mix the resulting lysate with 10 µl of 1x Laemmli sample buffer (Figure 1C3). Transfer the solution to a 1.5 ml collection tube. Note: The volume of sample Laemmli buffer is according to the number of embryos used (1 µl per embryo). After dechorionation, transfer embryos (20 μl volume) to a 1.5 ml tube containing 200 μl of ice-cold NB lysis buffer (Figure 1D1). Note: This will correspond approximately to between 1 to 2 μg/μl of final protein concentration. Manually homogenize embryos using a pestle (~10 strokes). Homogenization should ensure the complete breakdown of the tissue. If pestles are to be reused, wash them thoroughly before processing other samples. Transfer the supernatant to a new 1.5 ml tube, avoiding the upper lipid layer (Figure 1D2). Repeat this centrifugation process (steps B2 i-j) two more times. We like to thank Paulo Navarro-Costa for critical reading of manuscript and Rui Martinho for his supervi-sion. Funding: FCT-Fundaçao para a Ciencia e Tecnologia (Portugal): Leonardo Gastón Guilgur, SFRH/BPD/47957/2008. The funders had no role in study design, data collection and interpretation, or the decision to submit the work for publication. Copyright Prudêncio and Guilgur. This article is distributed under the terms of the Creative Commons Attribution License (CC BY 4.0).